Sandra Gram wins one of the quilts donated in the annual employee potluck. Employees and retirees of the Minnesota Department of Transportation, Department of Public Safety and Driver & Vehicle Services in Detroit Lakes held their 18th annual holiday potluck and fundraiser for Hospice on December 19, raising $2,120 for Hospice of the Red River Valley. Each December, the groups transform their lunchroom into a workshop of handcrafted and home-cooked items. Proceeds from the event have raised a total of $19,776 for Hospice of the Red River Valley since the event’s inception in 1995. Dana Hanson, Trudy Kordosky and Keven Meacham organized the annual event. Current and former employees donated a variety of items for the potluck and drawing, many of them handmade. Two very special handmade quilts were donated this year in honor of loved ones. Teresa Elkin donated a quilt in memory of her father-in-law, E.E. Elkin, who passed away in 2000, under the care of hospice services in Iowa. 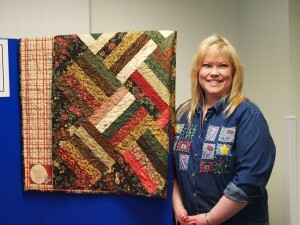 Sandra Gram, from MnDOT, was this year’s winner of Teresa’s quilt. Ann Boen made and donated a quilt in honor of Eugene Meyer, Ann’s late father. Doug Bergquist, from the Perham Truck Station at MnDOT, won this quilt.